The aviation and aerospace industries require metal buildings for many purposes, from R & D to manufacturing, from hangar parking to maintenance and repairs, to complete general aviation operations. To design and deliver these projects, demands a special set of skills and understanding of how to apply construction practices to the airport environments. Constructing aerospace and aviation buildings, be they aircraft hangars or airport facilities, present unique challenges to contractors. Their construction must be compliant with airport security and safety standards. They must take into consideration certain features such as eco-friendly green building practices, energy efficiency objectives and particular foundational conditions. Because aviation and aerospace facilities require large clearances and have other extraordinary characteristics, the design of these metal buildings is usually customized and given considerable care. In airport construction, security is always mandated. The contractor's delivery must address what tools and equipment are allowed in one area but disallowed in others. Also, airports usually insist on continual operation regardless of ongoing construction, so the construction plan must show how all airport activities will be maintained during the process. Erecting aircraft hangars has its own set of complexities to be considered in their design and construction. Aircraft dimensions dictate floor plan, clearspan requirements and eave height specifications. Doors are another element of consideration, with section doors, bi-fold doors and rolling doors all viable solutions. Besides these issues, there are fire protection issues, seismic considerations, as well as planning and building codes, zoning requirements and accessibility issues to manage. What is the nature of expertise essential to address these issues? First and foremost, the general contractor must be skilled at and experienced in furnishing a host of pre-construction services, for errors must be avoided and changes minimized at all costs. An important aspect of this is thorough, up-front planning based on careful consultation with the Owner and with the architectural/engineering team. A second important aspect is proactively communicating continuously with all affected parties before and during construction. The servicing rendered extends to risk and safety management, processing permits and protecting site conditions. The builder must anticipate challenges that might arise and do all in his power to avert problems. He must be skilled at keeping the big picture in view while tending to the myriad details involved with erecting steel buildings. More specifically, the contractor has to be intimately familiar with security issues in an airport setting. He must be familiar with the local environment in terms of zoning, building codes and relationships with subcontractors. He must also possess the special skills, equipment and labor force to provide and to erect pre-engineered metal buildings. Facility Builders & Erectors has earned an excellent reputation as a reliable contractor with aerospace and aviation customers. Our years of construction experience and our emphasis on construction management make us an ideal choice to provide buildings in this field. We visit sites extensively to assess all potential issues to be considered in a construction solution. We ask delving questions of owners to make sure they as well as we have a clear concept of the desired custom results. Facility Builders takes pride in keeping all communication channels open from concept to final delivery. FB&E strives to discover necessary design changes at the conceptual stage in order to avoid the expense of correcting mistakes already materialized in buildings. We work closely with designers to perform constructability analyses and to bring the most efficient and economical solution to our customers. 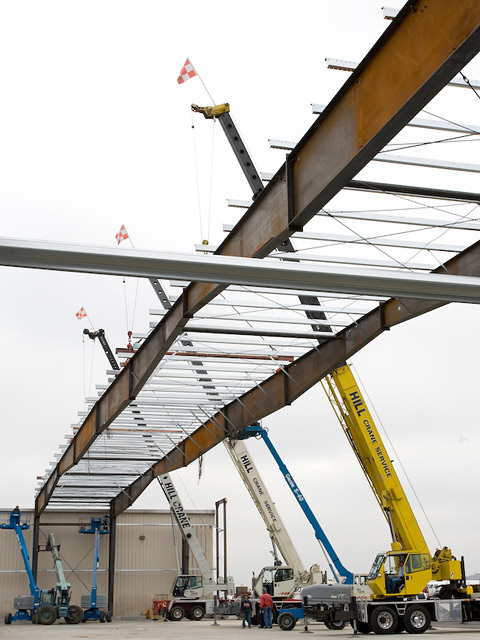 Facility Builders & Erectors understands pre-engineered steel buildings inside and out. Our team is skilled at operating the special equipment necessary and for managing safety. Others often subcontract with us for this specialized niche product, both for prefabrication of the metal frames and for their erection on site. Construction projects in the aerospace and aviation industries must be well managed for many reasons. Facility Builders & Erectors have been successfully delivering the associated custom metal buildings since 1993. We know all the issues, enjoy outstanding relationships with our current and past customers and are committed to doing the job right. Please contact us to get your facility on the right track.